Is the Prudential Paradox in the Meno? 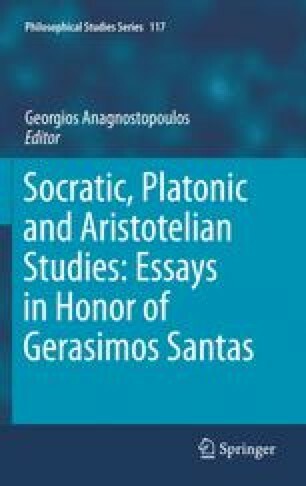 Few, if any, essays on the philosophy of Socrates have had a greater influence on contemporary scholarship than has Gerasimos Santas’ “The Socratic Paradoxes.”1 Prior to the publication of this paper in 1964, scholars were inclined to lump together two views that are prominent in Plato’s so-called early dialogues. The first is that no one wants what is bad for oneself and so all who pursue bad things do so involuntarily. The second is that because virtue is knowledge, all who do injustice and moral evil do so involuntarily. If taken to be expressions of what is essentially the same doctrine, each implies that, for Socrates, no one wants injustice in the way no one wants, say, ill health. Not surprisingly, until the publication of “The Socratic Paradoxes,” few scholars were inclined to take Socrates’ moral psychology very seriously, since it seems to fly in the face of the obvious truth that some people are actually quite eager to do injustice, at least when they can do it with impunity.